Electronic data interchange (EDI) is constantly increasing popularity and e.g. invoicing is moving rapidly from paper documents to electronic invoicing. EDI is promised to cut down manual work and thus to speed up a process. Significant gains can be reached only when electronic documents are valid. Otherwise a receiving end cannot fully automate own processes and error handling efforts dampens benefits close to zero. Truugo is the best solution for testing and improving quality of electronic documents! Traditionally message validation requires number of tools which needs to be installed, learned and maintained. Truugo is provided as a SaaS service. User uploads a message and Truugo performs all necessary tests with just one click. No installation, no learning, no maintenance. Traditionally a test process involves both parties from day one. It usually takes days or weeks to get any test feedback from another party. Bilateral and iterative testing is bound to certain people and thus a possible vacation or a sick leave forms a significant bottleneck. Truugo provides an instant feedback mechanism enabling error fixing and running new tests at the same time. Instead of weeks, testing may be completed within a day! General tools such as XML editors (XML Spy, Stylus Studio, oXygen) generate a technical feedback and thus specific technical knowledge is required to interpret those error descriptions. Truugo's test profile is based on test rules which are described as sensible conditions using a language and terms of a user group. Thus, depending on the case, a testing responsibility can be handed to a help desk, a substance expert, an IT professional or an application provider. Traditionally validation covers only message structure and some data format restrictions. 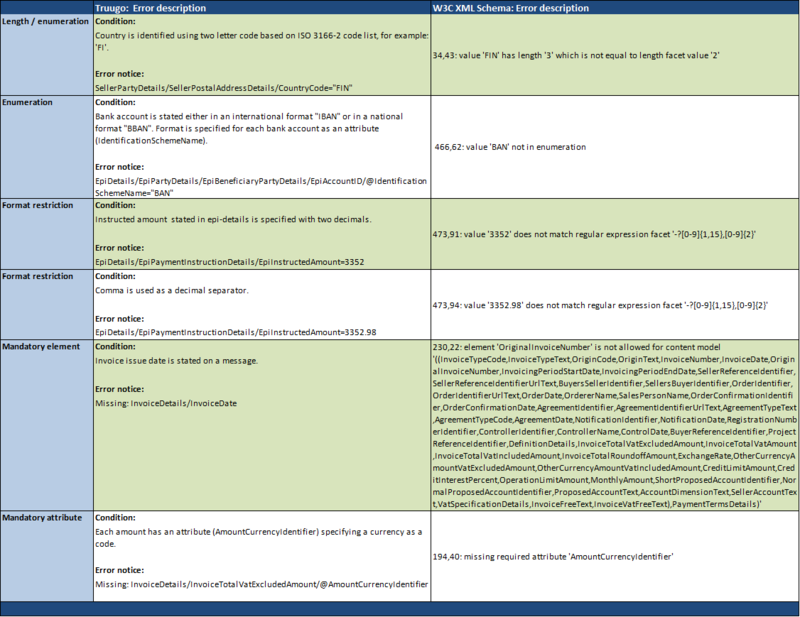 However, a majority of electronic documents have sum checks and various other interdependencies (either-or/if-then/neither-nor/both-and) which cannot be covered by a message schema (W3C XML Schema, DTD). Thus integrity errors are not detected until bilateral testing or until production starts (the worst case). Truugo is able to cover requirements related to message structure, data format and data integrity. Traditionally bilateral testing involves number of persons (project manager, substance expert, IT professional, application provider) from both organizations. A lot of resources are spent on iterations and status meetings thus prolonging a deployment schedule. A test process can be streamlined by using Truugo. A significant part of testing can be performed independently (without bilateral iterations) while Truugo covers also data format and integrity requirements. A user gets a sensible feedback from each test and thus no help is needed for interpretation. 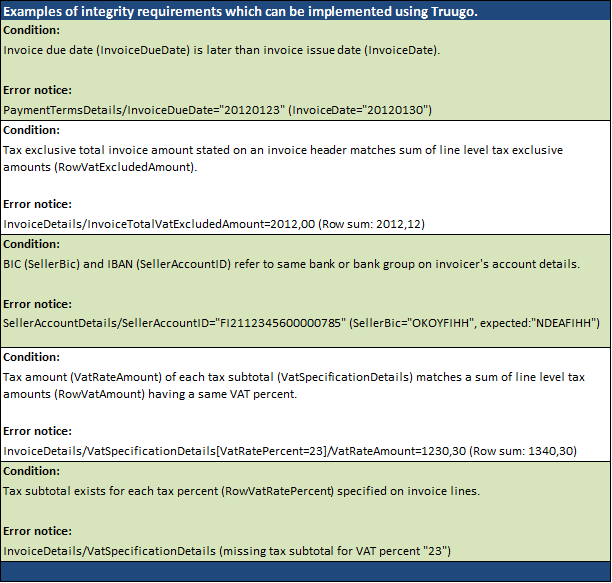 Traditionally testing involves a lot of redundant status inquiries as a part of a project reporting. Truugo testing activities are transparent as each test is recorded into user statistics. Test status, number of tests and possible problems are thus always viewable in real-time. A number of tests can be increased without an extra effort and cost. A need for bilateral testing decreases drastically and testing becomes less person-dependent. Self-service routine and instance feedback mechanism together minimizes time spent on testing. Modern and cost-efficient testing process lifts up company image and forms a competitive advantage for negotiating on new partnerships. There's no more need for having separate tools for EDIFACT testing. 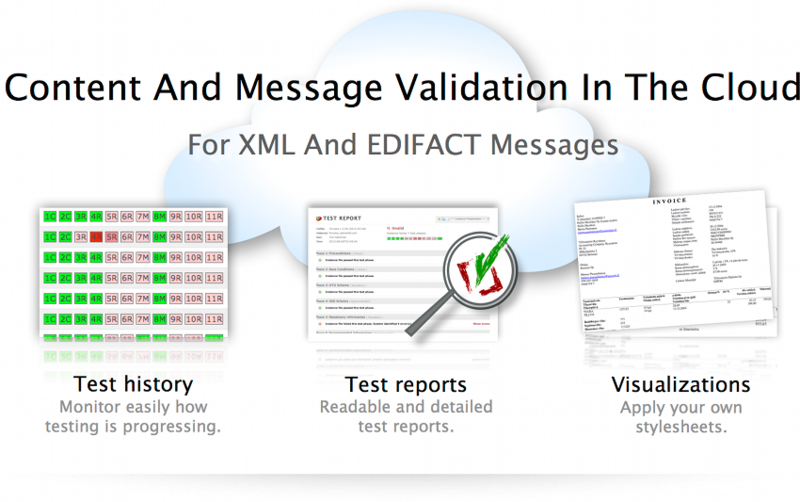 Truugo provides a unique solution for testing XML and EDIFACT messages in the same way. No software installation, no learning, just a click to get an instant feedback in a sensible format. Truugo provides a flexible testing model for a full or a partial process automation. In addition to manual tests, messages can be tested straight from existing systems via Truugo's FTP or Web service interface. Truugo may be compared with technical tools but one should note that it also provides actions for managing test activities. A team lead has features for guiding and following testing activities via own interface. Truugo allows you to provide message validation solution for your trading partners. Specify which profiles are available for external users and invite trading partners to join your validation group. Truugo is an excellent tool for a professional daily use but it also provides a simplified test form solution enabling a self-service concept for occasional users. A receiver may easily provide a self-service testing for new partners for a limited time using a test form. Single messages can be easily tested via Web interface but also larger quantities can be tested via FTP interface without extra effort.